Do not throw rocks at this sign. My eighth grade teacher Mr. Knox put a sign in the parking lot that said “Do Not Throw Rocks at This Sign.” He put it there to prove a point that if you tell a kid not to do something, most likely they will want to do it. He was right. By the end of the week, the sign was demolished. Maybe it is the kid in me or I’m just the rebellious type, but when a friend told me it is not possible to steam bend kiln dried lumber, I just had to try. My plan was to create a wooden handle that had three tight bends in it. Of course, my first try splintered along the outer radius of the bends, proving my friend right. Apparently, when wood is kiln dried, the lignin in the wood dries out and hardens, not allowing it to bend. Now, I am not a biologist, so I may not be qualified to explain exactly what lignin is. However, the same friend who told me you can’t steam bend kiln dried lumber provided me with this definition. Lignin is an organic substance binding the cells and fibers in wood together. By the way, he is not a biologist either. Not letting his explanation stop me, I set out to do my own research. I didn’t waste any time researching things that would tell me I couldn’t do it, like studying what lignin is. I did however find an old Woodwright’s shop episode were Roy Underhill showed how to use a metal strap during the bending process to compress the outer fibers, preventing them from splintering. Now the wood Roy used was not kiln dried, but his technique was what I was interested in and I thought it was worth a try. I headed off to the hardware store to find some flexible metal. It turns out they don’t really sell anything that I thought would work. Feeling defeated I headed towards the door to leave when I spotted a piece of metal banding sticking out of a trashcan. Not wanting to be tackled in the parking lot for stealing their trash, I found an employee and asked if I could have it. While giving me an odd look, he said “sure”. I headed back to the shop to test it out. On a side note, after showing my friend what I was using to prevent splintering, he suggested using metal strapping that plumbers use to secure pipes and ductwork, which can be purchased at most hardware stores. It took me a few practice runs to figure out how to keep the metal banding tight against the outside curves where the most splintering could happen. After some practice, it worked out pretty well. It didn’t stop all of the splintering, but the little parts that did splinter were easily sanded off. I have seen some elaborate setups for building steam boxes; however, my setup for this project was simple. Since the piece I wanted to bend was small, I just used a trash bag to contain the steam. To generate the steam, I snuck into my wife’s closet and got the little steamer she uses to steam out the wrinkles in her clothes (let’s keep that part on the down low). I stuck the end of the nozzle in the bag, taped it shut, and let it fill with steam for 30 minutes before pulling the piece out and bending it into my form and clamping it. When I showed my friend my accomplishment, he didn’t readily admit to defeat. He said, “The handle is only 1/8 inch thick, it is like a bent lamination.” On the other hand, unlike a bent lamination where the gluing of the layers are what holds its shape, this is only one piece of wood and no glue. It is holding its shape all on its own. The two outer curves are almost at a 90-degree bend, which is tough to do even with a 1/8 inch thick piece of wood. In the end, whether or not I am rebellious or just determined, I ended up with a beautiful steam bent handle. I screwed one end of the strap to the form. Then i used a pair of vise grips on the other end to pull with and keep tension on the metal strap while I tightened the clamps. The clamps did most of the bending work as it closed the form shut. The form I made is more of a bent lamination form style so handle was supported on both sides. Well, interesting. I never had anyone to tell me that I could not do it (bend kiln-dried lumber) so, unwittingly, I have been doing it for years; chair arms, table skirts and etc. I must admit that for large pieces like table skirts I have always done them as a set of 3/16″ or 1/4″ thick pieces and done a “formed glue-lam” construction to the final thickness of the part but otherwise it has always worked for me. I have, in the course of many projects learned to choose the pieces carefully, wild grain will almost always blow-out as it begins to dry and cool on the form… a metal strap not withstanding. Been there, heard it crack as I released the clamps. Sorry, gotta’ run… I hear cracking sounds from the other room. Maybe now that I know that you can’t do it all that stuff I have done in the past is failing? 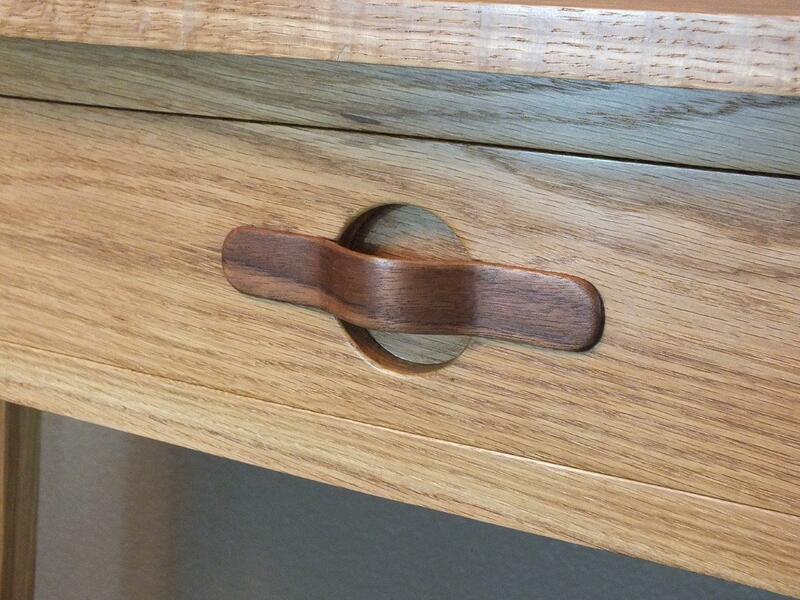 How did you attach the bent wood to the drawer fronts to make the pull? To attach the handle I used Titebond Wood Glue: https://www.highlandwoodworking.com/aliphatic-resin-titebond-glue.aspx. The long grain to long grain glue bond is plenty strong for a drawer of that size. I have been trying to bend white oak and hickory 7/8 and 3/4 inch diameters 14 inches long to make 90 degree bent custom chair braces. I am getting major splitting at about 30 to 45 degrees on the outside of the 90 bend. Have you ever tried to bend anything that thick? Soaked the wood for 4 days, steamed with two steams attached to 4 inch X 2 foot long pvc capped at end with screw top. Steamed continuously for 6 hrs with two Earlex Steam Generators. We are at 6300 ft altitude water boils at 200 degrees. Using both Kiln dried and non kiln dried so far neither have been successful. We have not tried supporting the outside of the curve, will try that next. We are interested in any suggestions. Supporting the outside of the bend is probably the only way you will get a successful bend at that radius. Steven, have you tried steaming the wood for a shorter amount of time ? I’ve had luck with this rule of thumb : 1 hour of steaming per inches of thickness. You might be overdoing it. And the backing is a must. I use an old leather belt and it works wonder. On YouTube a fellow was dealing with this same issue, where he did the thing with the strap, but want onto say adding Downy Fabric softener to the water and soaking the wood for a week claiming excellent success. I don’t recall the name of it but I punched in Can kiln dried wood be steam bent. Then I went to the you tube page. I’m case anyone wanted to know.